The Vent-Axia Jupiter range of de-stratification units is based on direct drive axial fans, housed in a neat and sturdy casing complete with eyebolts for suspension from chains or steel wires. 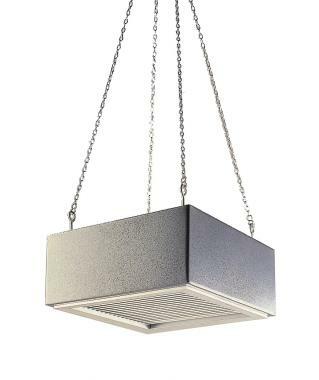 Ideal for applications where the proposed mounting height requires higher velocity fans or where open bladed ceiling fans are considered unsuitable. Jupiter fans can be used in stores, warehouses, factories, workshops, as well as many other industrial applications. The unit provides effective and positive air movement to improve the working environment, particularly during summer months. In addition Jupiter fans can be used during the winter to re-circulate hot air from ceilings and roofs down to living and working areas. controllable motors. The motor hub and impeller are statically and dynamically balanced for smooth operation and optimum performance. Class F insulation, suitable for operating in atmospheres of up to 95% RH and ambient temperature of up to +60˚C. For cooling effect, circulation of air is required in any given area. As a guide, mount Jupiter fans 4.5-6m apart, in tropical climates 3m apart. Fans should be mounted so that they do not interfere with lighting installations in any way. Mount fans away from walls or pillars where possible to avoid obstruction of airflow. Heat savings are largely dependent on the difference between the roof level and the working level temperatures, the ventilation rate and the geographical position.